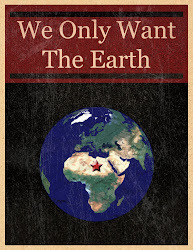 We Only Want The Earth is intended to critique and analyse Irish, International and Student Politics from the perspective of an Irish left wing political activist. The blog does not attempt to be unbiased and all articles will be from a left / socialist perspective. All comments and criticisms are welcome. If you would like to contribute an article to the blog, feel free to contact me. We Only Want The Earth was created in March 2011 to share, discuss and debate issues in the public arena. The name of the blog is an unashamed homage to the great Irish Socialist James Connolly, who penned a song of the same name.